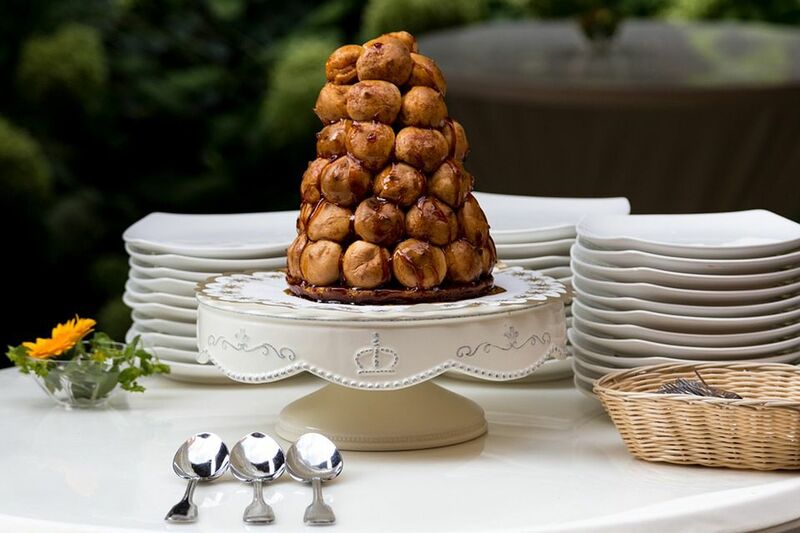 Croquembouche is the French word for "crunch in the mouth" and is a classic French dessert once used as a wedding cake (compare with Eastern European tree cakes). As with most tasty dishes, this French confection made its way to Eastern Europe and is enjoyed there also. A croquembouche is made with custard-filled cream puffs that are assembled in a pyramid shape stuck together with caramel. Spun-sugar caramel is draped around the cream puff tree for dramatic effect. This makes a stunning dessert for any special occasion. It's not as hard as it looks, especially if you use a foil-covered Styrofoam cone to attach the cream puffs to. It just takes a little time. If you refrigerate this, the spun sugar will start to melt. It's best to add this touch just before serving or leave it off entirely. Make the pastry cream first so it has a chance to set up while you make the puffs. Here are step-by-step instructions on how to make a Croquembouche. Note: while there are multiple steps to this recipe, this croquembouche is broken down into workable categories to help you better plan for preparation and baking. Scald milk in medium saucepan. In a small bowl, whisk together sugar, flour, cornstarch, and salt. Gradually stir into scalded milk and reduce heat to medium-low. Add eggs and cook until thick, stirring constantly. Remove from heat, and mix in butter and vanilla. Place plastic wrap on the surface of the cream so a skin doesn't form and chill until cold. Make the cream puffs while filling is chilling. The whipped cream will be added after pastry cream chills. In a medium saucepan, melt 6 ounces butter in boiling water. Add flour and salt. Cook, stirring constantly with a wooden spoon until it forms a ball that won't separate. Remove from heat. Transfer to a mixing bowl or stand mixer. Add the 6 eggs, one at a time, beating well after each. The paste will separate as you add each egg, but with continued beating will smooth out. Heat oven to 400 F. To form cream puffs, use a plain tip and pipe small, equal-sized balls of dough 2 inches apart on a parchment-lined pan. If the piped dough balls have peaks, use a pastry brush dipped in a little egg white to pat it smooth. Bake 35 to 40 minutes or until golden brown. Let cool completely. Remove pastry cream from refrigerator and beat with a mixer until smooth. Fold in the whipped cream. Fill a piping bag fitted with a thin nozzle-type tip with the cream and plunge the tip into the side of each cooled cream puff shell and fill with pastry cream. Cover a medium-size Styrofoam cone with aluminum foil and place it on a cake circle that has been covered with aluminum foil and set aside. Place 1 1/2 cups sugar, corn syrup and 2/3 cup water in a small heavy saucepan and stir to blend ingredients. Place on high heat and cook until syrup turns light amber. DO NOT STIR during this time but wash down the sides of the pan with a pastry brush dipped in hot water about every 2 minutes. It will take 7 to 9 minutes for the caramel to cook. Watch closely at the end because the sugar can burn easily. When the caramel is light amber, remove from heat and wait for bubbles to disappear (about 3 to 4 minutes). Starting at the base of the foil-covered cone, dip flat end of filled cream puffs quickly in hot caramel (be careful not to burn your fingers) and apply it to the bottom of the cone. Repeat until the entire cone is covered. If caramel is too cool, it can be rewarmed carefully over low heat. Using a fork, or spun sugar tool (or a whisk with the end cut off and the prongs spread apart), dip into caramel and move back and forth over a parchment-lined pan to form long, thin threads. Before the caramel has a chance to cool, pick it up to drape around the croquembouche. Continue for as much caramel draping as you would like.